It may be boldest move yet by a company known for being audacious: Google is spending US$12.5bil to buy Motorola Mobility. But the big prize isn't Motorola's lineup of cellphones, computer Tablets and cable set-top boxes. It is Motorola's more than 17,000 patents - a crucial weapon in an intellectual arms race with Apple, Microsoft and Oracle to gain more control over the increasingly lucrative market for smartphones, Tablets and other mobile devices. If approved by federal regulators, the deal announced on Monday could also trigger more multibillion-dollar buyouts. Nokia Corp, another cellphone manufacturer, and Research In Motion Ltd, which makes the BlackBerry, loom as prime targets. The patents would help Google defend Android, its operating system for mobile devices, against a litany of lawsuits alleging that Google and its partners pilfered the innovations of other companies. In addition to the existing trove of patents that attracted Google's interest, Motorola, which introduced its first cellphone nearly 30 years ago, has 7,500 others awaiting approval. Phone makers and software companies are engaged in all-out combat over patents for mobile devices. The tussle has been egged on by the US patent system, which makes it possible to patent any number of phone features. Patents can cover the smallest detail, such as the way icons are positioned on a smartphone's screen. Companies can own intellectual-property rights to the finger swipes that allow you to switch between applications or scroll through displayed text. Apple, for example, has patented the way an application expands to fill the screen when its icon is tapped. The maker of the iPhone sued Taiwan's HTC Corp because it makes Android phones that employ a similar visual gimmick. The iPhone's success triggered the patent showdown. Apple's handset revolutionised the way people interact with phones and led to copycat attempts, most of which relied on the free Android software that Google introduced in 2008. Android revolves around open-source coding that can be tweaked to suit the needs of different vendors. That flexibility and Android's growing popularity have fuelled the legal attacks. About 550,000 devices running the software are activated each day. Many upstart manufacturers, like HTC, had only small patent portfolios of their own, leaving them vulnerable to Apple Inc and Microsoft Corp.
Getting Motorola's patents would allow Google to offer legal cover for HTC and dozens of other device makers, including Samsung Electronics Co, that depend on Android. The deal is by far the largest Google has pursued in its 13-year history. Motorola Mobility's price tag exceeds the combined US$10.2bil that the company has paid for 136 previous acquisitions since going public in 2004, according to filings with the Securities and Exchange Commission. Buying Motorola also would push Google into phone and computer Tablet manufacturing, competing with other device makers who rely on Android. The largest makers of Android devices are all supporting a deal that Google CEO Larry Page said was too tempting to resist. "With mobility increasingly taking centre stage in the computing revolution, the combination with Motorola is an extremely important step in Google's continuing evolution," Page told analysts in a conference call on Monday. Google pounced on Motorola less than two months after a group including Apple and Microsoft paid US$4.5bil for 6,000 patents owned by Nortel, a bankrupt Canadian maker of telecommunications equipment. Leaving no doubt about the mounting antagonism among the companies, Google's top lawyer lambasted Apple and Microsoft for their legal manoeuvring earlier this month in a blog post titled "When patents attack Android." "We believe this acquisition was solely driven by the ongoing patent war," Sanford Bernstein analyst Pierre Ferragu wrote in a research note, referring to the Google deal. Apple and Google were once so close that Google's former CEO, Eric Schmidt, sat on Apple's board. But Google has since rolled out Android and provided hardware makers a way to counter the iPhone and iPad. Schmidt resigned from Apple's board two years ago. Microsoft, for years one of Google's most bitter rivals, is desperately trying to make inroads in the mobile device market. John McCarthy, an analyst with Forrester Research, said Microsoft may try to counter Google by pursuing a long-rumoured takeover of its partner, Nokia. Oracle Corp is seeking billions of dollars from Google in a federal lawsuit alleging that Android owes licensing fees for using the Java programming language that Oracle acquired from Sun Microsystems. Buying patent protection offered by Motorola Mobility will be expensive. Although Google has US$39bil in cash and can easily afford it, the price translates to US$40 per share, 63% above Motorola's stock price before the deal was announced. Motorola Mobility Holdings Inc's stock soared 56%, or US$13.65, to US$38.12. Google Inc lost about 1% and closed at US$557.23. The deal will test Page's ability to avoid a clash of cultures while he is still learning the nuances of the CEO job, which he took only four and a half months ago. With 19,000 workers, Motorola Mobility's payroll isn't that much smaller than Google's 28,800. It's a coup for Motorola Mobility CEO Sanjay Jha and the company's largest shareholder, billionaire investor Carl Icahn, who had been pressuring Jha to cash in on the patent portfolio. With an 11.4% stake in Motorola Mobility, Icahn is in line to be paid more than US$1.3bil. Motorola Mobility, based in Libertyville, Illinois, has been struggling to come up with a product that has mass-market appeal since it introduced the Razr cellphone in 2005. The company had some success with the Droid, one of the first phones to run on Android, but it now ranks a distant eighth in the smartphone market, with 4.4 million units shipped in the second quarter, according to research firm Canaccord Genuity. By comparison, the market-leading iPhone shipped about 20 million. An attempt to counter the iPad hasn't paid off for Motorola Mobility, either. 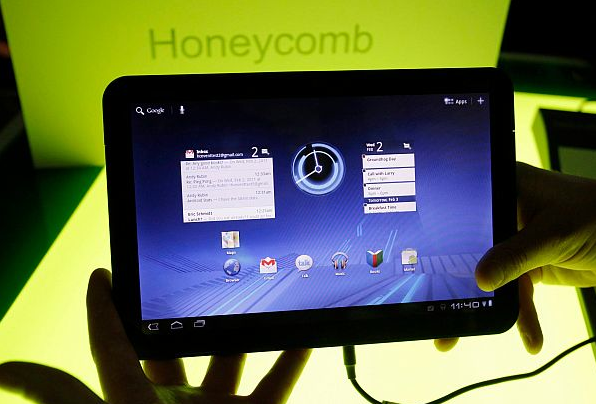 In an effort to drum up more demand, the company recently cut the price on the WiFi-only version of its Tablet, the Xoom, to US$499 from US$599. The troubles saddled Motorola Mobility with a US$56mil loss in its latest quarter, sinking the company's stock price to one of its lowest points since its January spinoff from the old Motorola Inc. The remaining part of that company now runs as Motorola Solutions Inc. In contrast, Google earned US$2.5bil in its most recent quarter ending in June.